A signature Tacoma, WA attraction has a new look. 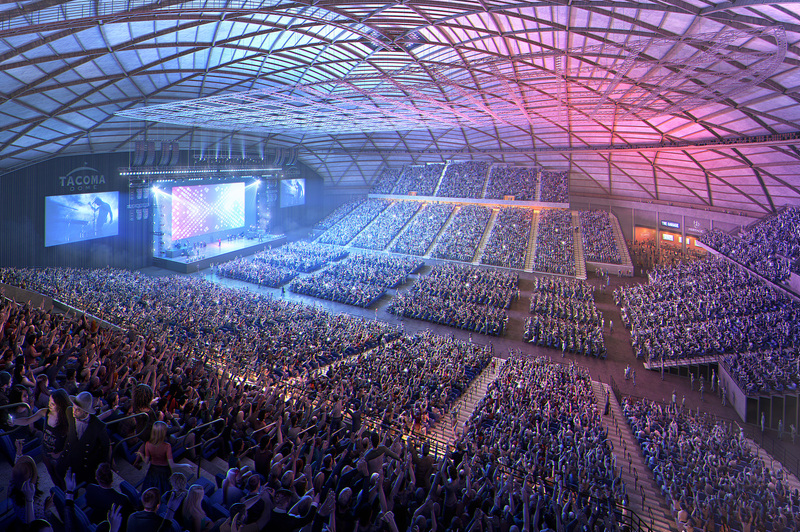 The Tacoma Dome has undergone a more than $30-million renovation, a project that should result in a more comfortable environment for everything from major concerts to community events. The Tacoma Dome has been nothing short of versatile since opening in 1983. While it has been used for sporting events—including the 1994-95 home schedule for the NBA’s Seattle SuperSonics, who were awaiting the completion of renovations to their home in Seattle—it is best known as a host for large concerts and community gatherings. It has maintained a robust event schedule for decades, but officials realized in the years leading up to the renovation that it was due for changes. This summer, the Tacoma Dome closed to accommodate construction on its first major renovation in its history, one that should address customer comfort. The highlight of those changes is a total seat replacement, as the venue’s old bench seating on the upper level has been swapped out in favor of new individual seats, while the lower level is receiving new retractable seating. The seating replacement should result in increased comfort, but the new retractable seating should provide a major logistical advantage. In the past, the process of removing seating to accommodate an event’s configuration was a time consuming and labor-intensive process, but the new seating should remove many of those issues. Tacoma Dome’s restroom capacity is increasing by 300% to address what had been a major need at the facility, while lighting and sound system upgrades were also a part of the renovation. Tacoma Dome has traditionally had the advantage of being the largest indoor venue in its market, but Bedier and city officials did not see that as a reason to stand pat with the facility. “We really wanted to make sure that we improved the customer comfort experience,” she said. “We’re the largest indoor venue in the market so we get shows, but we want people to walk away thinking that it was a great place to go to a show, not just be forced to go there for the show. While the customer experience improvements might be the most visible enhancements to visitors of the facility, they are not the only major changes. Back-of-house space has been enhanced, including upgrades to the dressing rooms, and improved loading docks have been added. Concerts will continue to be a major part of Tacoma Dome’s schedule, evidenced in part by a November lineup that includes Drake, VetsAid, two Justin Timberlake shows, Twenty One Pilots, and Fletwood Mac (Elton John will play there next September as part of his Farewell Yellow Brick Road tour). In addition to concerts, however, Tacoma Dome is positioned to carry out its place as a community gathering place. The ability to host trade shows, graduations, regional sports games, and more is part of Tacoma Dome’s formula for standing out in the marketplace, and the renovations should allow it to continue that mission. Tacoma is part of the Seattle metropolitan area, which also includes Seattle’s KeyArena—a venue that is set to undergo a $700 million overhaul led by Oak View Group that will raise it to modern NBA and NHL standards. When asked how she thought the upcoming KeyArena project would affect Tacoma Dome, Bedier said she believed that the facilities will compliment each other. Tacoma Dome’s history is unique, and its ability to accommodate a range from large concerts to community events is part of its identity. With these changes, Bedier believes it is poised to be the site of many more memories.